We also offer fire restoration and flood damage restoration services and a specialist restoration consultancy. Its an easy choice with Edinburgh Cleaning Services. We have a one-year guarantee on our work, as well as discounts for new customers and great deals for returning customers. Call today to find out more about what we have on offer! As part of our commitment to customer service, we happily move furniture and offer flexible evening and Saturday bookings. 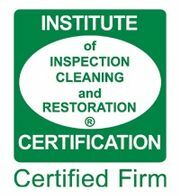 Our memberships include the NCCA (National Carpet Cleaners Association and IICRC(The Institute of Inspection, Cleaning and Restoration Certification). We are also one of the only cleaning companies in Scotland to be TrustMark-accredited. Discover the secret to a more beautiful home with help from our experienced staff. Edinburgh Cleaning Services have been providing superb service for more than a decade, and weve gone from strength to strength over the years on the basis of the quality of our work as well as our attention to detail. Call now for all your cleaning needs! Call Edinburgh Cleaning Services today on 0131 660 0220, for expert work when you need it most as well as advice from our seasoned specialists. Alternatively, e-mail us via info@edinburghcleaningservices.co.uk and leave your details with us now.